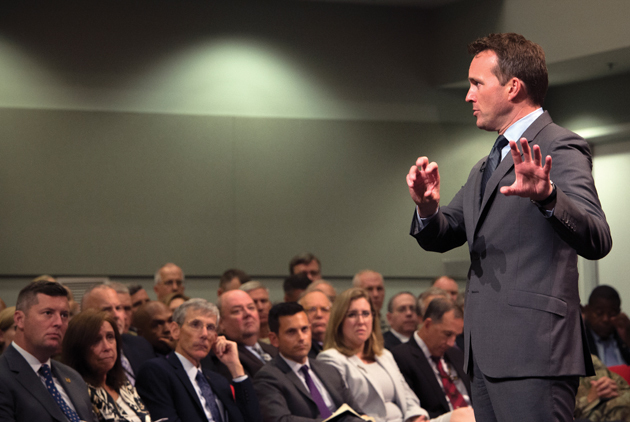 Secretary of the Army Eric Fanning addresses Army civilians and members of the Army staff during a town hall meeting, Aug. 23, 2016. WASHINGTON (Army News Service) — Reflecting on his most recent trip to the Pacific, which included a stop in Malaysia, Secretary of the Army Eric K. Fanning said he was impressed by the interaction he observed there between American Soldiers and Malaysian forces, who are now participating in Exercise Keris Strike. “It impressed upon me something that I didn’t see in my time in previous services that do a lot of exercises as well,” said Fanning, who has served in the past as acting Secretary of the Air Force, and also as an undersecretary with the Navy. That kind of interaction between soldiers he said, puts a face on the United States in a way that is not possible through other diplomatic efforts. Fanning spoke on Tuesday, Aug. 23, at the Pentagon to a packed house of Army staff on his priorities for the coming months as part of his first town hall meeting there. He said he plans to give such talks more often in the future. “For me, we have to keep the pressure on prevention of sexual assault. We have done a lot on responding to sexual assault. But I’d like to make the response stuff unnecessary,” Fanning said. Suicide prevention, he said, is another area where the Army has led the way. That’s an area where he wants to keep the pressure on to solve as well. “I get asked about this a lot,” he said, noting that there is a misconception about the prevalence of suicide in the Army. The Army is only slightly worse than the rest of society. He said researchers in and out of the military are looking at the issue — and that the research has given rise to even more questions. Researchers are still learning about post-traumatic stress disorder among World War II veterans, for instance. 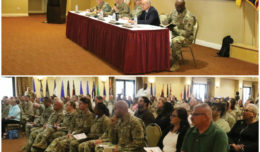 “But if somebody joins the Army, serves their country, is willing to make the ultimate sacrifice, we need to know from the behavioral health side if they have done anything in the line of service that has caused them problems,” he said. 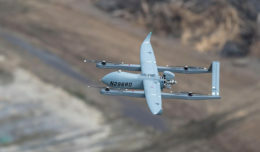 “It’s really designed to focus on [those times] where we see our overmatch on our capabilities isn’t really where we thought it was going to be,” he said. Most recently, that’s been informed by what Russia is doing in Ukraine and Syria, in the way of cyber, electronic warfare, position navigation timing and survivability. What’s being seen there raises questions about Army readiness in those areas, Fanning said. “These are anti-access-type capabilities where we need a larger gap than what we have,” he said. The Rapid Capability Office is not about getting equipment out to the field faster, he said. It’s about capabilities. 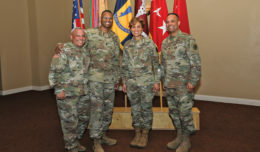 He said that much of what the Rapid Capability Office will do will be aimed at streamlining bureaucracy in places that now stymie efforts to bring the latest technology to the warfighter as quickly as possible. Fanning also said he and Chief of Staff of the Army Gen. Mark A. Milley will soon be looking at how the Army headquarters is organized. He was quick to add that this had nothing to do with the number of people involved or the dollars going toward personnel. Primarily, he said, he is hoping to streamline communication efforts to ensure that he and the chief of staff are getting the information they need in time to make decisions using that information. And at the same time, he said, to provide the right information to those on the staff — so they too get the information they need from the top. “We want to find ways to inject our thoughts and guidance earlier in the process, which hopefully saves you a lot of time, because you’re not having to move something up through the system and get it thrown back down and back up and back down, he said.